Gardenzest is a new generation, natural plant health booster. A biotechnology breakthrough in home gardening products. Gardenzest is not a chemical fertiliser or an organic brew. 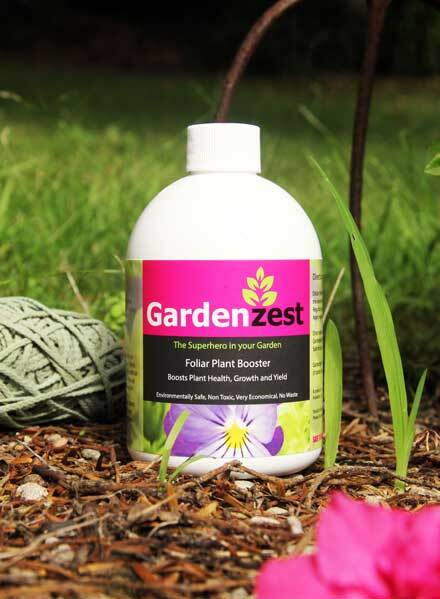 Gardenzest is a combination of plant extracts, an elicitor, scientifically formulated to put your plants’ defence and growth systems in high gear – enabling your plants to reach their full, natural potential without the addition of harmful chemicals. When the specially crafted Gardenzest molecules hit your plant’s leaves they trigger or ‘elicit’ a positive reaction. Your plants respond to Gardenzest by producing a series of essential oils to ward off pest, disease and environmental stress. These essential oils are also beneficial for gardeners as they increase flavour, colour, fragrance and growth. Without any stress your plants are free to achieve their full, natural potential and grow big and beautiful! Use Gardenzest on your garden and describe how you find using the product and the results. If possible carry out a mini trial using 2 very similar groups of plants (one sprayed and one not) and describe the results. There is information on how to do this and what to look for on our website and we are happy to provide advice. You may wish to update the review later in the season when your plants flower or fruit. If you wish, we can also supply 5x 100ml bottles for a giveaway. 100mls makes 10 litres of spray – you only mist the leaves of your plants so a little goes a long way.